Chores and allowance didn’t always go together in our house, but we’ve recently made the switch to start tying together the chores the kids need to do and the allowance they want. Getting kids to do chores around the house can be challenging to say the least, so motivating them with their allowance is a win-win. 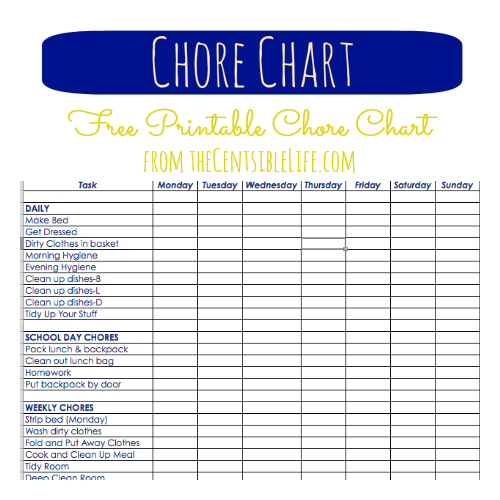 By creating a chore chart/chore list for the kids it gives them freedom and independence to get things done without my constant nagging. I benefit by not having to keep all their to do items in my head (more space for my own enormous lists) and they learn how to manage on their own. If they don’t know what to do ‘next’ when prepping for school or bedtime, I just tell them to look at their list. Teaching life skills like how to make a bed goes hand in hand with how to manage money. So we’ve made an adjustment in our house to allowances to help the kids tie both skills together. While previously we used their allowance as a tool for teaching our kids money management, now their allowance is tied to their work. The kids each have a list of daily chores, school day chores (like doing homework), and weekly chores (like stripping their bed sheets to be washed). If they complete everything they get their allowance. I check them on the weekend (they get paid on Sunday) and if there are things they haven’t done they can often make up their work over the weekend. We recently made some tweaks to how they receive their allowance, and tying their allowance to chores has made an even bigger impact. It makes it easy to make sure they get done what they need to without micromanagement. Below I’ve included a printable Excel Chore Chart. It’s free to download, and you can modify it to suit your family’s needs and chores. How do we Pay out Their Allowance? You can read more about the tweaks we made in my New Year, New Allowance post. For the younger kids we can easily track their allowance via a simple notebook. We keep a log of their funds and pay once a week. We also do a monthly sweep into their savings accounts. A portion of their allowance goes to savings, and anything ‘leftover’ gets directed there as well. For our oldest (who is a teen) his money is directly deposited onto a prepaid card to use at his convenience. Additionally we track a portion of his allowance to deposit into a monthly savings sweep as well. This allows us to track where his savings are easily, and help show him the importance of saving. Using a prepaid card is extremely convenient for teens since they can use it almost anywhere. Do you tie chores to allowance? How do you manage chores in your house? Thank you for the chore chart! You saved me a ton of time and it is perfect for my teenagers! I can respect that. We started off that way but it’s just not working for our family. Since their job is to learn life skills and be successful students this is something I’ve changed my stance on. I just do it once a week. It’s much less time consuming than constant reminders of what they should be doing. What a great motivator! That’s exactly how we’re handling things. Just remember you can always change things if it’s not working out! That’s exactly how we started out. Allowance was a tool and the extra chores were paid. However it just wasn’t working for us so that’s why we made the adjustment. What a great idea and I love how simple it is. And thank you for the chart printable. This is a fantastic resource, Kelly! Thank you! We’re going through this very debate in my house now. My 9 yo wants allowance but I am adamantly against paying my child for the things he’s supposed to be doing. So as a compromise we’ve just started giving him a little for doing “extras” around the house and are in the process of defining what is a responsibility and what is an extra. Thanks, Kelly. We have been having the allowance conversation a lot lately….need to definitely come up with a plan. Our children had chores and it was tied to their allowance. It included helping with dinner, setting the table, clearing the table, making their bed and cleaning their rooms. We also required that they saved at least half of what they earned. As an added incentive, I would match their savings to by a car. I announced the incentive when they were roughly 13 years old. How do you handle the added headache of remembering to initial everything or is the onus on the child? I’m already drowning in the micro-managing that is three children with homework folders & school planners.